I wish I could say this is me reclining naked, in my living room on my red velvet sofa, but alas, only the jungle part is true. I lugged in my plants last night due to a possible freeze. The plant profusion did remind me of this jungle though, sans birds (but I swear I heard lions). I love the feathered statuesque lilies, waving like plumage. The lioness with her starting eyes, eyeing you– the prey. An elephant trumpets loudly from the brush. A slithery coral hued snake. The full moon, a pearly marble orb. It’s as if Rousseau took a slice of imaginary jungle, flattened between the pages of a book. The foreground and background are flattened out like a flower that you press in a book and then frame; the plants here are a series of botanical prints all shoved together will-nilly. Rigid and pointy. Very graphic. The bristly plants contrast with the rounded form of the woman’s body. And then, the stare of beady unsettling yellow eyes. The red couch lady gazes languidly on. Looking, but not seeing. Garden of Eden or Heart of Darkness ala Conrad? (Rousseau painted it right before his death) It’s entirely possible that it is both. I know my living room is. My grandmother what sharp teeth you have. . . 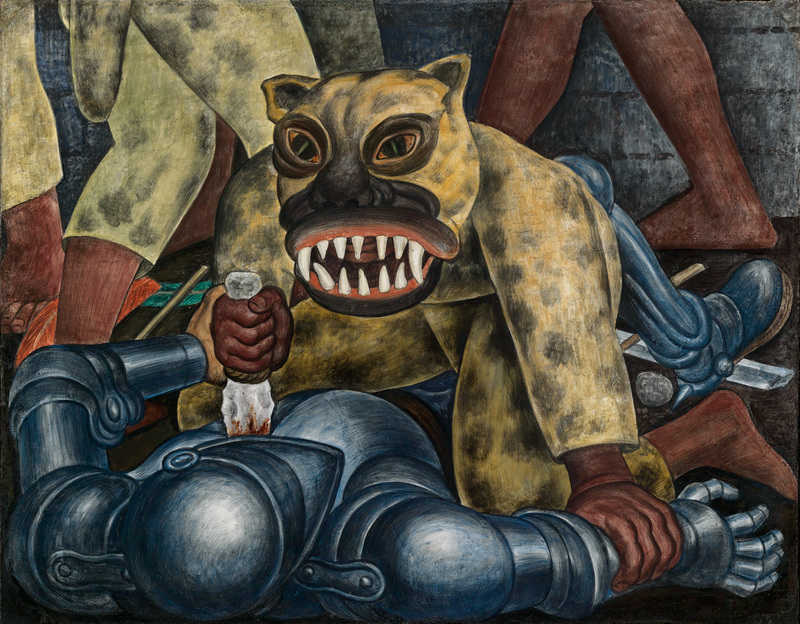 These teeth have gnawed away at my memory for weeks since I saw this small Diego Rivera mural at the MOMA. Interesting note: When we entered the exhibit, we walked into a sea of sprawling legs — a group of children diligently drawing, laid out on the floor, right in front of this painting. On worksheets with number two pencils. Drawing these dangerous, snapping jaws with abandon. So yes, the painting calls the poor of 1910’s Mexico to rise up against their oppressors, recalling the conquistador’s invasion into the Aztec civilization in the 16th century. But if you watch closely and listen, you may hear a feral rattling. . . parts of you that have been exiled from your mind. Those that may one day show their glinting white teeth.